Buy online cheap Montana Woodworks Glacier 4 Post Square Dining Table in Country Finish (mwk-MWGCDT4PS). This amazing Dining Tables will suit your dining rooms. Buy and save your Montana Woodworks Glacier 4 Post Square Dining Table in Country Finish (mwk-MWGCDT4PS) today. 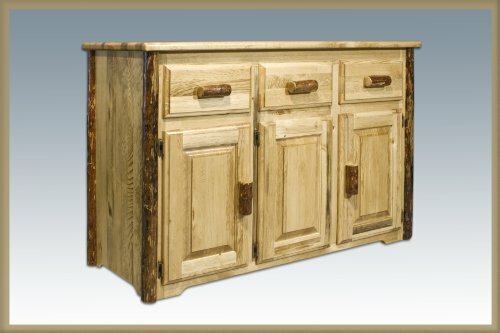 Rustic charm and durable Warranty: 20 year limited Made from solid american grown wood Minimal assembly required 45 in. L x 45 in. W x 30 in. H (85 lbs.) A vastly popular size of the classic Montana Woodworks. Combine with the Montana Woodworks side chairs, captains chairs or the new 45 inch plank style bench for just the right seating style. Finished in the “Glacier Country” collection style for a truly unique, one-of-a-kind look reminiscent of the Grand Lodges of the Rockies, circa 1900. First we remove the outer bark while leaving the inner, cambium layer intact for texture and contrast. Then the finish is completed in an eight step, professional spraying process that applies stain and lacquer for a beautiful, long lasting finish.